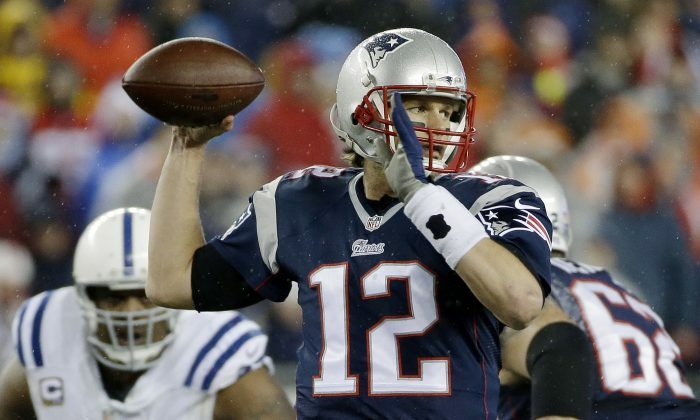 Amid reports that the NFL discovered the New England Patriots deflated 11 of 12 game footballs before the AFC Championship with the Indianapolis Colts, many want to know the word-for-word rules as stated by the NFL on inflating and deflating. The Ball must be a “Wilson,” hand selected, bearing the signature of the Commissioner of the League, Roger Goodell. The ball shall be made up of an inflated (12 1/2 to 13 1/2 pounds) urethane bladder enclosed in a pebble grained, leather case (natural tan color) without corrugations of any kind. It shall have the form of a prolate spheroid and the size and weight shall be: long axis, 11 to 11 1/4 inches; long circumference, 28 to 28 1/2 inches; short circumference, 21 to 21 1/4 inches; weight, 14 to 15 ounces. The Referee shall be the sole judge as to whether all balls offered for play comply with these specifications. A pump is to be furnished by the home club, and the balls shall remain under the supervision of the Referee until they are delivered to the ball attendant just prior to the start of the game. ESPN reported that 11 of the 12 balls were about 2 pounds per square inch under the league’s requirement. Each team will make 12 primary balls available for testing by the Referee two hours and 15 minutes prior to the starting time of the game to meet League requirements. The home team will also make 12 backup balls available for testing in all stadiums. In addition, the visitors, at their discretion, may bring 12 backup balls to be tested by the Referee for games held in outdoor stadiums. For all games, eight new footballs, sealed in a special box and shipped by the manufacturer to the Referee, will be opened in the officials’ locker room two hours and 15 minutes prior to the starting time of the game. These balls are to be specially marked by the Referee and used exclusively for the kicking game. In the event a home team ball does not conform to specifications, or its supply is exhausted, the Referee shall secure a proper ball from the visitors and, failing that, use the best available ball. Any such circumstances must be reported to the Commissioner. In case of rain or a wet, muddy, or slippery field, a playable ball shall be used at the request of the offensive team’s center. The Game Clock shall not stop for such action (unless undue delay occurs).